Daria Salus has been working with small metals for over 15 years, now working in Santa Cruz California but always inspired by nature. 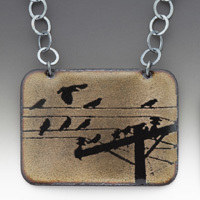 She hand fabricates all work using techniques like photo etching, embossing, forming, enameling, and bezel setting. The process used to create her images in enamel is her own unique version of the basse-taille technique. It involves a photo-etching process, and the application of an underglaze to set off the etched image in black. She then uses transparent enamels to add color to the piece while allowing the image to show through. Many of Daria’s images come from photos she has taken herself. After moving to The Bay Area, I now find myself in a transition in my approach to painting. Abstraction is creeping in, and I find a new love and joy of the pure application of paint. Some images are apparent, at times, but the more formal concerns are with the juxtaposition of color, line and shapes and the movement created throughout the composition. I start with no preconceived idea, shapes merge, disappear, reappear to be reborn, and create a narrative of some sorts until it all seems a finished dance. James Scott's passion for wood began in Europe. He worked in Germany making flutes, while studying old recorders and baroque flutes in the museums until 1982. He later moved to Berkeley, raised a family, and started a career in computer engineering. He has recently come full circle to his creative past. "What I make has flexibility, I can be experimental with colors and shapes. Wood is beautiful nothing compares to taking a few scraps of it and watching something emerge. I am enchanted by the smell of it, I can recognize 20 different kinds of wood by their scent alone." Color and Shape are at the heart of the human experience and they are the twin rulers of my aesthetic. I use my fine art training in every one of my pieces, be it in a painted art pins, earrings and wall art, or in the rainbow of colors of the translucent earrings and necklaces. A shape without paint to aid in the process, must carry all the visual interest by itself. Joan Brown, Frida Kahlo, John Singer Sargent and the Pre-Raphaelites are some of my art heroes, and I consider them all part of fine art history. My pieces are inspired by nature and a life long love of fantasy and science fiction. You will not find a replica of a terrestrial flower or butterfly, rather, a collection of flora that could exist somewhere. I use the Italian Millifiori (million flowers) method of caning to create the leaves. The technique was used by the ancient Romans and Phoenicians to work glass, in modern times, polymer clay artists have embraced this versatile technique which makes it possible to create images in a tube shape. I am a painter and a sculptor. Whatever medium I work with I push it and myself beyond the traditional boundaries. The process for my two-dimensional abstract artwork begins by producing a clay monoprint that is transferred onto geotextile, mounted on a board to which I add mixed media. As a sculptor I work as a carver combining unconventional materials such as clay with fabric and Polymer with silk. I come from a long lineage of immigrats who fled countries and continents due to physical, political, or economic survival. My personal life journey and those of my ancestors, the hardships of persecutions, wars, and social injustice influence my sculptural work. I use earth tones, rough texture, and figures succumb to the emotional load to reflect this struggle. My art also encompasses the fullness of the human experience found in the diversity of many cultures including spiritual beliefs, languages, culinary ethnic delights, colorful stories, humor, poetry, joy, and love. These are absorbed and celebrated by individuals generationally exposed to a variety of cultures. In my paintings I celebrate this aspect of the nomad’s journey by using vibrant colors, depth, movement and poetic influence. I love beauty and find it often in flowers and leaves. I consider myself a simple person with a straightforward approach. I enlarge the botanical specimens so others may find their beauty of form and color more readily. My job as an artist is to help others find beauty in simplicity. For the past 30 years, I have helped people peel away layers of their past, look at each layer in detail for patterns and repetitions. I have worked to clarify hidden meanings and to stretch a person’s desires and potential to their fullest, to think outside of the box and to keep what is dear and put aside the unnecessary. People remain who they are at their core, but have more freedom to develop the best parts. This is a process of deconstruction and reconstruction with careful attention and deep feelings. I experience a parallel process when I create art. Ethan Snyderman is a Berkeley Artist born and raised. When he isn’t carving woodblocks late into the night, the elusive printmaker gravitates towards either the sea or riparian environments in search of natural treasures and solace. The Artist favors the reduction technique for color prints– multiple layers are built up in succession from the same piece of wood. No matter the Artist’s intention, the medium ultimately determines qualities of the image. Intuitive decisions are made along the way, thus the end product is always different from the initial sketch. Valerie Sobel is an artist of many trades. She shares her time between mixed media painting and textile art. She finds inspiration in nature, world culture and historical fashion, to create objects that people can enjoy and use in their daily life. The designer works with natural materials such as wool, silk, linen and cotton. Her concern for the environment also led her to explore the use of discarded pieces of fabric and second hand clothes which she deconstructs, and fashions into new elements. She often combines a variety of felting techniques as well as sewing, embroidery and beading. My work emphasizes the process of blowing and forming hot glass using design elements that can be incorporated into the molten material. The long tradition of working with the material in its "purest form" is compelling. My challenge is to add these elements into the pieces and still maintain the integrity of the process. I want to capture the beauty that can be implicit in the simplest form, line and color. Woodwork has been a part of my life for many years. Over the past several years, I have been designing jewelry boxes, creating hardwood earrings, making animal jigsaw puzzles for children and using lovely walnut for creating decorative trivets. 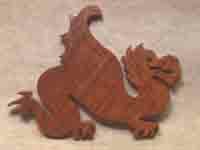 I use exotic hardwoods because of their unusual colors, patterns and textures. Finding new woods with beautiful hues and intrinsic figured patterns in them is a big part of the excitement, creativity and fun of making useful and aesthetically pleasing hardwood artwork. My goal in designing and fabricating jewelry is to achieve a line and flow reflecting forms that occur in nature. The materials themselves create their own flow. I feel like I am listening to the metal or stone. I play with them until the form tells me to stop. My jewelry is a expression of my spirit, to be in harmony with the natural world. Irene Storch began studying fine arts after moving to the Bay Area from Germany in 1981. Eventually her interests expanded into jewelry-making. Equally inspired by the designs and materials of modern technology as those of nature and ancient crafts (like wearing wire-wrapping) her jewelry symbolizes the interaction between the two. Dave was born in Oakland, California, and grew up in the San Francisco Bay Area. He first discovered glassblowing while studying music at UC Santa Cruz, and went on to earn a BFA in Glass from CSU Chico. While in school Dave supplemented his education by attending various workshops at the Corning Museum of Glass in New York, the Haystack Mountain School of Crafts in Maine, and the Pilchuck Glass School in Washington, where he also worked as a seasonal staff member. He currently lives and works in the San Francisco Bay Area. Hearkening back to the days of yore, Carolyn’s jewelry taps into a primal and internal sense of history. Either in the repurposing of vintage Edwardian jewelry (most notably items created with Guilloche enamel) or into the Jungian archetypes of Alchemical symbols or commonplace utensils, there is a sense of mystery in relation to tradition, ritual, and a personal mythology. The symbolic storytelling within each piece of jewelry bridges a primal need for body adornment with a secret Gnosis encased in each piece that is worn. My work is defined by its rich texture and the use of a simple color scheme. Using everyday materials, I transform them into 3D textures. With pigment, water and glue I accentuates the texture on the canvas. The results are abstract, non-representational, mixed-media art. My second act as an artist is proof of life beyond high-tech. As an electrical engineer, I focused on following specific rules to design electronic systems. Art simply invites the desire for free expression without boundaries or rules. Art invites the freedom to have fun.